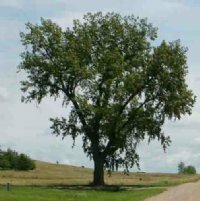 PLAINS COTTONWOOD - a large spreading tree reaching 60 to 90 feet in height and 40 to 60 feet in spread. This native specie occurs along waterways and wet meadows throughout the Plains states. Greater drought and alkalinity tolerance than many of the euramericana hybrid poplar cultivars but is susceptible to leaf rust and canker diseases. Produces seed in tufts of "cotton". "